Starting kindergarten will be one of the biggest milestones of your child’s life—it will also be one of the biggest milestones in your parenting life. Kissing your child goodbye on that first day of kindergarten will not only be a day filled with tears, but also filled with high expectations for the future. Every parent wants his or her child to have a great experience in kindergarten. After all, it is meant to set students up for future success in school and in life. Because this is such a major life event for both you and your child, it’s perfectly normal to worry whether your child is ready for kindergarten or not. 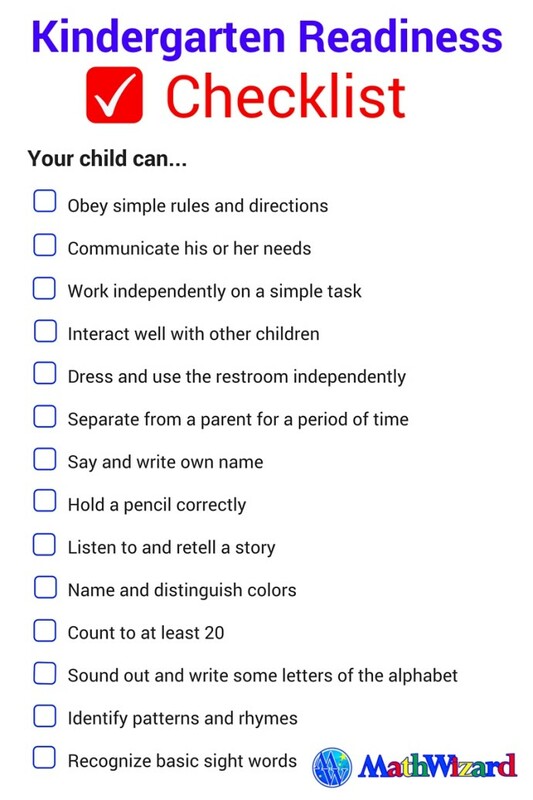 To ease your worries, we, at MathWizard, have compiled a list of kindergarten readiness indicators that many schools test or ask for before a student enters kindergarten. This list contains both academic and non-academic indicators. It is perfectly fine if your child does not meet every indicator, as all students have room for improvement upon entering any grade. However, it is always recommended to work on ideas and concepts with your child. 1.Obey simple rules or directions (raise your hand, stand in line, wait your turn, etc.). Give simple directions at home or while running errands: set the table, push in your chair, wait in line, etc. Keep these directions simple and only one step at a time (i.e. Please say “thank you,” not “Please say thank you and give your grandma a hug.”). Talk to your child about the importance of following the teacher’s rules. Play “school,” with your child as the teacher and you as the student and follow your child’s “rules” that they make as the teacher (this models good behavior). Try an app that turns following directions into a game. 2. Communicate his or her needs. Encourage your child to explain how he or she feels. o When your child is visibly upset (screaming, crying, etc. ), say “use your words.” Wait until your child has used words to communicate what he wants (i.e. if he’s crying because he’s hungry, try not to give him food until he says, “I’m hungry.”). In normal conversation, encourage your child to speak in full sentences and avoid pointing to something that he wants. Encourage your child to ask questions when he is confused. If your child asks, “why?” (which all children do), try to answer him honestly instead of shutting him down, which will discourage your child from asking questions. 3.Work independently on a grade-appropriate task. Encourage your child to play independently (color, “read” books, etc.). Praise your child when he/she does something by himself/herself. Give your student “homework” and try not to help him with everything. o A great way to start to introduce him to “homework” is through enrichment programs. 4. Interact well with other children. Set up play dates with other children, especially children who will be in your child’s class. Model good behavior when you play with your child (show your child that you share, say “thank you” and “sorry,” never hit or scream at someone else, and congratulate a winner). 5. Dress and use the restroom independently. Give your child opportunities at home to dress himself/herself. Show him/her how to zip a zipper, button a shirt, and tie a shoe. Try to do this as much as possible (I know it’s easy to do it for your child, especially when you’re in a rush, but set aside some time to practice this). If your child does something wrong (buttons the wrong way, puts the shoe on the wrong foot), don’t criticize. Praise him/her for his/her efforts and then show him/her how to fix it (if he/she won’t let you fix it at that moment, ignore it and fix the mistake at a later time—don’t make it into a fight). Allow your child to use the restroom independently (after you have shown him or her the proper technique). Try to listen and make sure he or she washes his hands. o Stools always help since kids sometimes can’t reach the sink. Your child’s name on the stool may make it even more fun. o There’s fun soap and spouts to encourage children to wash their hands. o Have your child sing a song they like while they wash their hands. Keep them washing until their song is complete. 6.Separate from a parent for class time. Allow other people to babysit for the day or night. Start with the grandparents or close friends. Sign your child up for activities where you wait in a waiting room or drop them off. Anenrichment center is great practice for school. Visit the school before the first day of class. If you can, try to schedule a visit with your child’s teacher before class starts, too. 7.Say and write his own name (parent’s name would also be beneficial). Practice saying mom and dad’s names as well as the names of any siblings your child may have. When you color or practice writing, have your child write his or her own name. Make crafts together and have your child write his name on it before putting it on the fridge (your child will be so proud of his/her craft and his/her name on the craft). 8. Hold a pencil correctly. Try a Twist ‘N’ Write pencil before graduating up to a big kid pencil. When your child is ready to use a regular pencil, have him/her pinch his/her index finger and thumb together, and then slip in the pencil. 9. Listen to and retell a story. Read, read, read! After you read to your child, ask him what he just read (or after every page). Introduce longer books as his attention increases. Go to the library if there is a time dedicated to “story-time.” This is great practice for story-time at your child’s school. 10. Name and distinguish colors. Start with your child’s favorite colors. Tell them the name. When your child colors, practice colors by asking them to take out certain colors (red, blue, yellow, etc.). Build on these colors a couple at a time. Paint! Finger painting is fun and allows your child to physically touch the color. Ask colors about things around your child: favorite fruit, shirt, toy, etc. 11. Count to at least 20. Count with your child during the day. When you go up the stairs, count the stairs; when you play with blocks, count the blocks; when you put away toys, count how many toys you both put away; etc. Show your child how numbers are used in everyday life: in cooking, on the microwave, with money, etc. Try joining a Kindergarten math program in June before school starts. 12. Sound out and write some letters of the alphabet. Try joining a Kindergarten English program in June before school starts. Make patterns with your child using blocks and shapes. Start by singing songs or reading books like Dr. Seuss or any nursery rhyme. 15. Recognize some basic words (sight words). When you read, point out common words. Start with only one or two words at first (“a” or “the” is recommend). Eventually have your child point out the “a” or the “the” in the book. Have your child write the sight word that he learned from the book. Play sight-word games when you and your child find the sight words (that your child knows) in real life: on a sign, in a magazine or ad, etc. This list is not an exhaustive one, but it’s a start. If you have more concerns, talk to his pre-kindergarten teacher or future kindergarten teacher for more information. You should also consider your school’s cut-off date. Each state has a different cut-off date, but your child should be 5 before or on that date. Check with your child’s future school for more information on this. If you have major concerns, you can also choose to redshirt your child. Redshirting is when you delay the kindergarten start-date for your 5 year-old to the next year. This is sometimes encouraged if your child has a birthday close to the cut-off date (i.e. If the cut-off date is September 1, and your child turns 5 on August 30.). Typically, this is encouraged when your child is physically smaller than the other children or behind socially or academically. When you do consider redshirting, please discuss this with academic professionals and consider the long-term effects of redshirting your child (he will be the oldest in his grade, graduate a year later than someone of his typical age, etc.). What other questions do you have about your child’s readiness? Authors: Elaine Timbuleng, Teacher and Writer at MathWizard, Inc. and Becky Adams, English Program Manager at MathWizard, Inc.